Picture steep rugged mountains, pristine clear lakes, gnarled and twisting trees, dense green forests, aspen trees peppering dry mountain sides, and a massive desert with miles and miles of sandy peaks as far as the eye can see. 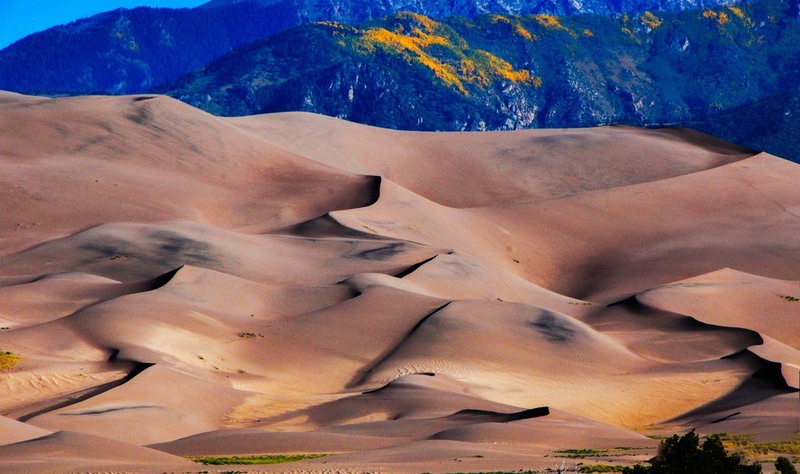 Without a doubt, Great Sand Dunes National Park has some of the most diverse and interesting scenery of all of the 59 national parks. 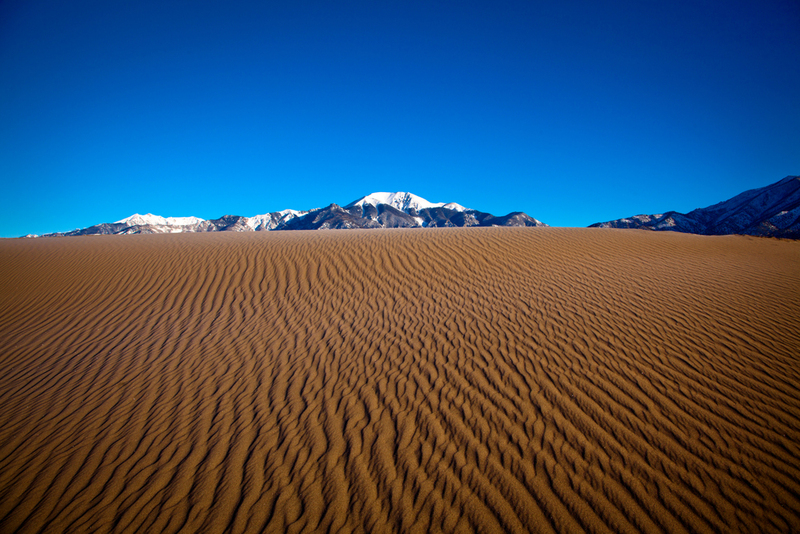 If you're looking for an adventure, the sand dunes are a great place to try your hand at sand boarding or sledding. 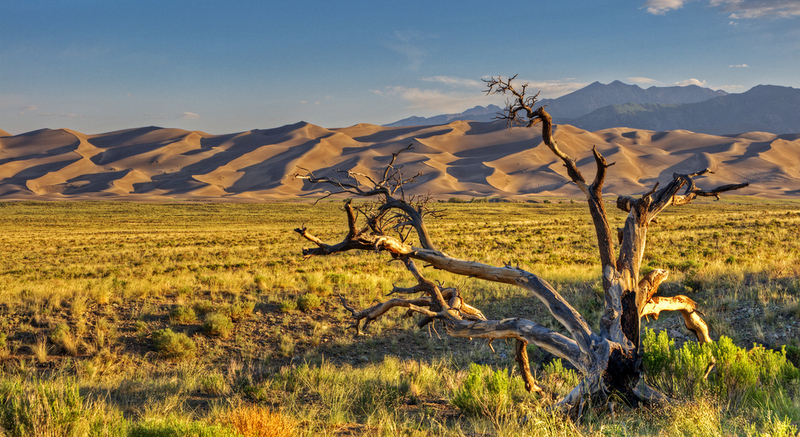 With 30 miles of sandy peaks to explore and ride, you could spend your entire trip at the dunes. The sand can get up to 150 degrees during summer afternoons and can freeze during the winter, so wear good shoes and plan your trip accordingly. 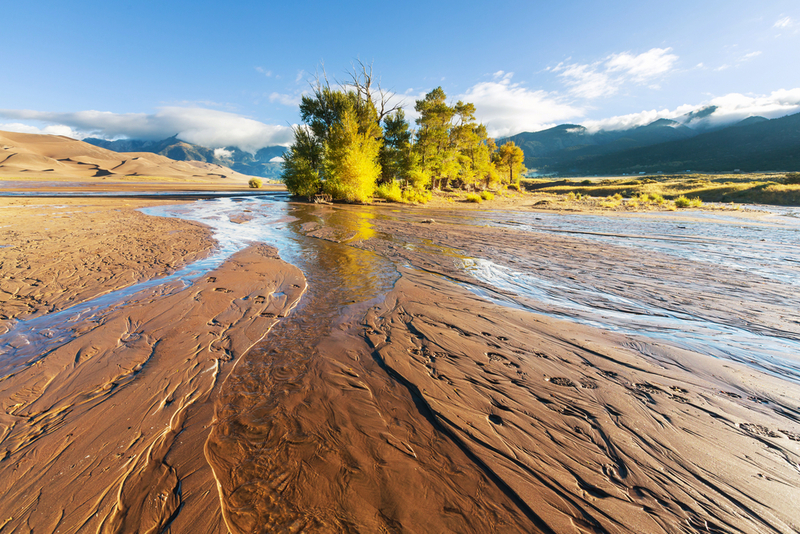 Medano creek flows along the base of the sand dunes, providing a relaxing place to wade or lazily float while enjoying the magnificent scenery of 740 foot sand peaks, steep rugged mountains and exquisite aspen forests. 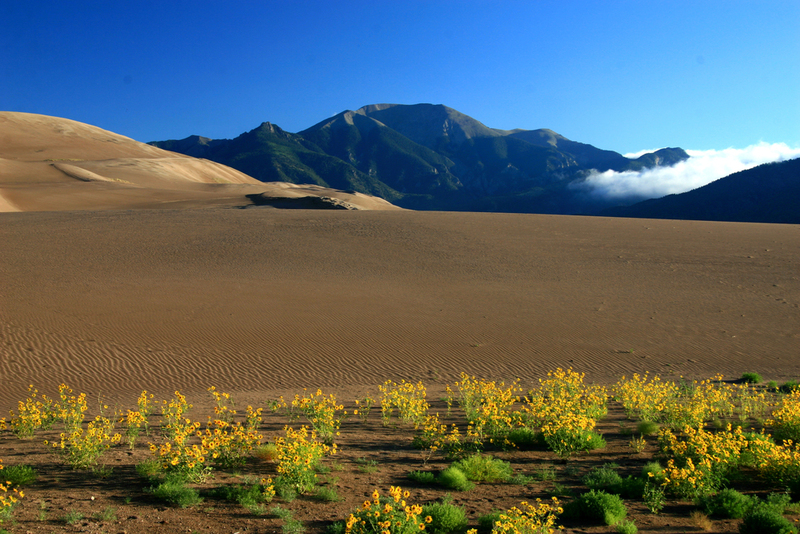 The Sangre De Cristo mountains are one of the most impressive views upon arrival to the park. 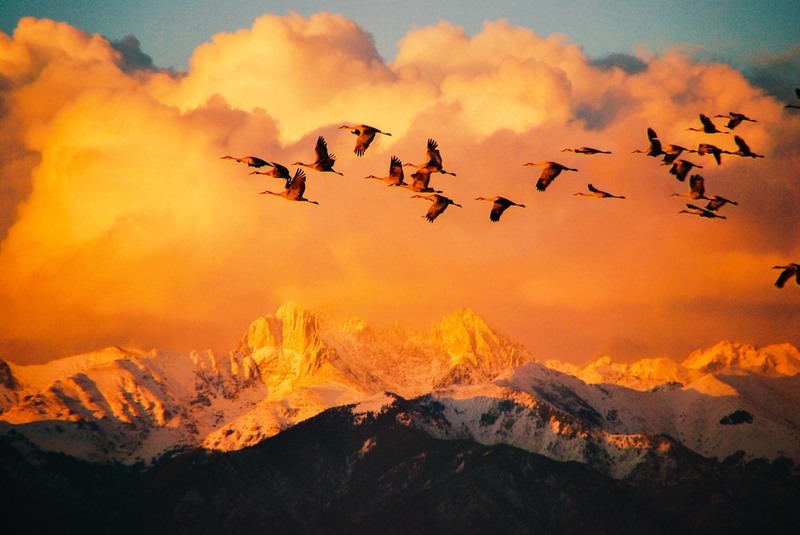 With a whopping seven peaks over 13,000 feet, these mountains are awe-inspiring and majestic. Such diverse terrain entails diverse animal species. 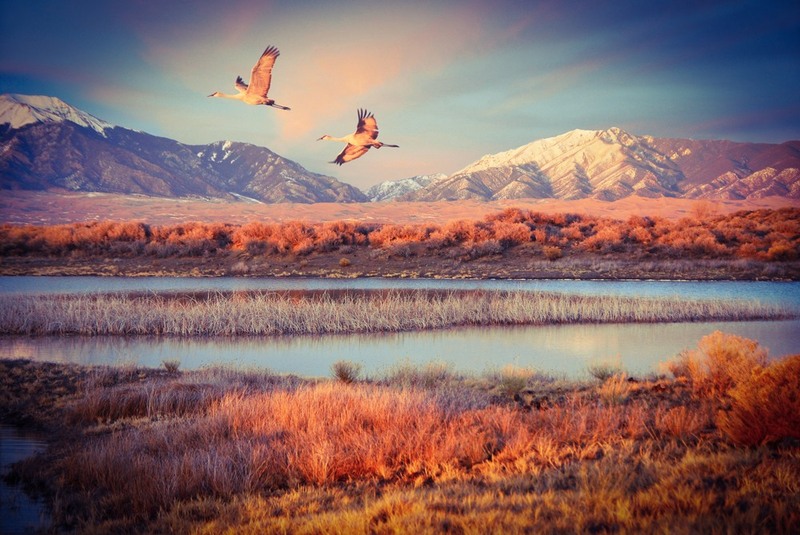 Bears, elk, bighorn sheep, mountain lions, beavers, bison and badgers are just a few of the various animals you might be able to observe in their natural habitat. Keep an eye out for the cute and hearty little Ord's Kangaroo Rat. This tiny creature is perfectly suited for desert living and is the only mammal in the park which can survive in the sand dunes for its entire life. The kangaroo rat does not need to drink water, instead it receives moisture from the seeds that it eats. To avoid its many large predators, the kangaroo rat can jump up to 9 feet in the air with the help of its huge back legs. Quite a feat for the 3-5 inch creature weighing only 4 ounces. This interesting little animal has impeccable hearing, it can even hear the wings of an owl flying quietly above the sand during the night. This is yet another survival instinct that has kept these kangaroo rats alive and away from endangerment. The industrious kangaroo rat likes to burrow in the sand and create tunnels and caves to live in. They spend most of the day underground to stay cool, so they typically can only be seen at night. There are so many great trails for backpacking and hiking to explore in the park. If you'd rather blaze your own trail, the dunes are a great place to do so. The dunes provides a unique backpacking experience without any trails to follow, and challenging terrain to hike. You can set up camp right in the dunes wherever your voyage takes you. 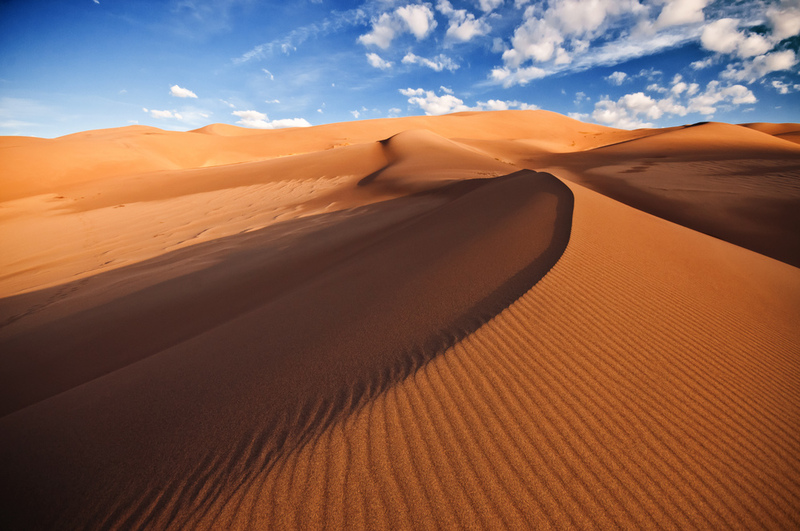 Be sure to check the weather forecast before setting out for a backpacking trip in the dunes, lightning and sandstorms are frequent hazards for hikers. Watch for a glimpse of the Kangaroo Rat in the evening and be prepared for a breathtaking view of the dazzling night sky.